Team building is one of the best ways to easily boost productivity within a business. Not only does it give employees a chance to get to know each other on a deeper level, but it’s great fun too! 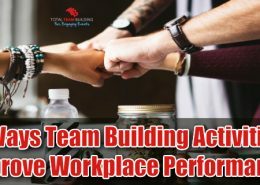 Nobody wants to work somewhere if they don’t feel a connection to their coworkers and that is why team building activities are so powerful for businesses of all shapes and sizes. Below are 3 ways they can enhance productivity and performance within your business. What Are Team Building Activities? First, you need to understand what team building activities actually are. These aren’t the same as team outings or team meetings. They’re activities that are specifically designed to open lines of communication and build trust between team members. These are usually led by a team building specialist, but they can also be organised by management. 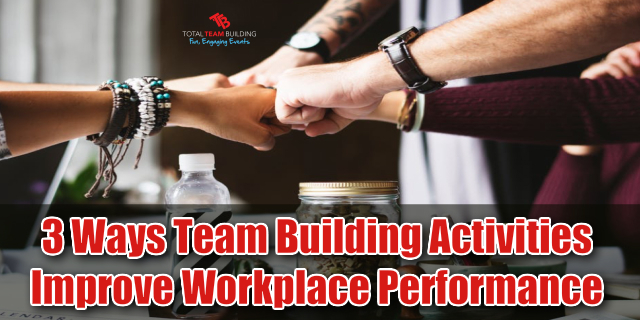 Team building activities aren’t just for big companies with an overwhelming number of employees, they’re also great for companies of all sizes and dynamics! Even small companies can benefit from taking the time to build lines of communication and teamwork. Studies show that businesses with engaged employees see twice as much annual income compared to companies with less engaged employees. Create your own boosted levels of engagement with team building activities. One of the first ways team building activities creates higher levels of productivity is through open lines of communication. While employees work with each other on a daily basis, they likely don’t communicate as well as they should. Communication is key to the success of any business. Forbes claims communication is one of the most important skills of today, and that businesses need to make it a priority in the modern age. By working together as a team on an activity that isn’t bound by the pressures of the workplace, it’s easy to communicate freely. When planning activities for your team, encourage team members to speak openly with each other. Create a safe space for talking about problems in the workplace without worrying about repercussions. The more open the lines of communication are, the more positive your workplace will become! One of the most unexpected benefits of team building activities is learning more about your team and your business. You likely have strengths and weaknesses as a business that might not be apparent in your day to day practice. If you take a moment to step away from your normal routine and examine the areas you can improve, you’ll be able to identify your best strengths and weaknesses. These activities can also identify strengths and weaknesses on a team level. You’ll notice individual star players who succeed in communicating and performance while you’ll notice others who struggle behind. This might show you areas where you can improve your own leadership, and who might deserve greater responsibility within your business. Group activities are a great way to boost creativity. When you’re working on the same projects every day in the same way, it’s easy to fall into a routine. As a business, you need to always work on ways to creatively solve problems by pushing your team from their comfort zone to solve new problems and see things in a different light. As a business, you should encourage your employees to be creative. Some business leaders think creativity is less important than productivity. Business News Daily agrees creativity is essential to business success in all types of industries, not just marketing and design. As an industry leader, creativity needs to be a priority. In order for your event to be successful, you need to have the right plan. Choose a day that isn’t essential to any projects or deadlines. Be sure to check on this page (US) or here (Aust) to ensure you aren’t interfering with any holidays! Then, decide on the best activities for your team. When in doubt, speak with your team about what activities appeal most to them. Consider areas you know you’re weak as a team and brainstorm activities that break down the most important barriers. As long as you’re proactive about the success of your team, you’ll feel the benefits. 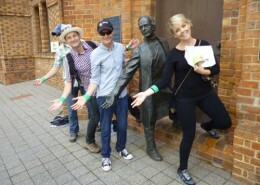 Team building activities are vital to the success of any business. It doesn’t matter how big your team is or what industry you work in, it’s essential you have a productive, happy environment for your employees. When teams feel like their leaders care about the environment, they’re more willing to put in their best effort every day! Are Charity Team Building Programs Worth It? https://www.totalteambuilding.com.au/wp-content/uploads/2016/01/ttb-logo-new.png 0 0 Ella https://www.totalteambuilding.com.au/wp-content/uploads/2016/01/ttb-logo-new.png Ella2013-08-22 08:00:002013-08-22 08:00:00Are Charity Team Building Programs Worth It?